Dedication In Dentistry — Demonstrated Excellence. 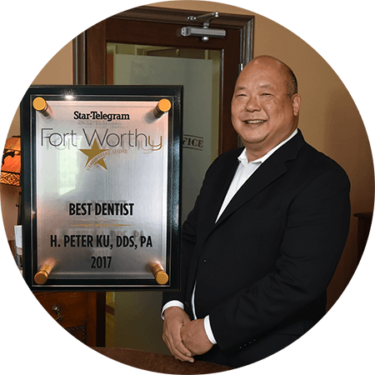 Dr. H. Peter Ku was awarded as the Best Fort Worth Dentist in 2017 and 2018 by the Star-Telegram, and he and his team prioritize excellence in all aspects of family dental care. Dr. Ku loves this community and has served the Fort Worth area and the thousands of smiles that have come through his doors in more than 20 years. Will yours be next? I went to Dr. Ku for a six month cleaning and needed a deep cleaning. He was very nice and professional, he explained everything to me and helped me understand why the treatment was needed. His office was very friendly from Karen who greeted me upon check in and Vanessa who let me know what my insurance was going to pay and what I would be responsible for. 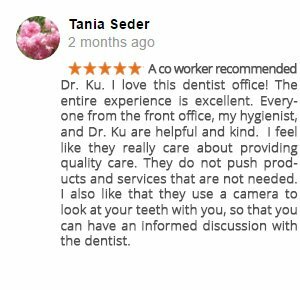 I am very satisfied with the services I have received from Dr. Ku and will continue going to his office for all my dental needs. I have referred four other people to his office who are also satisfied with his services. I'm so glad Dr. Ku was recommended to us by a friend. It's so nice to be treated like a patient that matters rather than just another person. I'm not into pain and Dr. Ku's office knows it. Even with the cleanings and checkups, it's almost painless. I will be recommending him and his office to my friends in the Fort Worth area. With my insurance I can go to any dentist but I don't need to look any further. 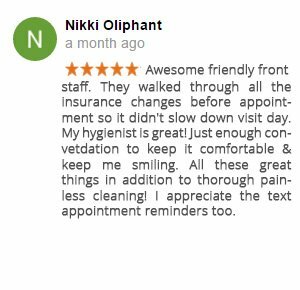 I have my usual cleaning every (6) months and it is always a pleasant visit...Stephanie is the best I have had to clean my teeth. Then Dr. Ku comes in to check my teeth to see how they are doing and to make any recommended work to have done. They send a note to the front desk that I will need the price for any work recommended and show before costs and what I will have to pay. They are very friendly, easy to work with and a very nice and is a very clean environment. I would highly recommend (and do) Dr. Ku and his staff. Dr Ku and his staff offer great dental care. Quality, professional dental work still exists with Dr. Ku. Our entire family use Dr. Ku for our dental needs. 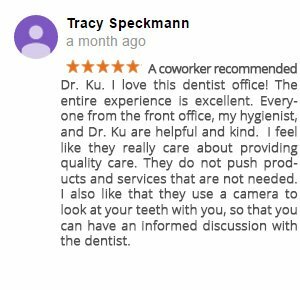 Stephanie is great with our teeth cleaning & Debbie works great with Dr. Ku. I just had my 2nd crown in October 2012 and I'm very pleased. We will continue to drive across Fort Worth to visit Dr. Ku and his staff. After 10 years, they are like family to us. Fantastic! I've never liked going to the dentist, until I started seeing the friendly staff at Dr Ku's office. Dr Ku and his hygienist, Stephanie, are professional, thorough, gentle, quick, and use the best technology. The location of his office is convenient and parking is easy. The office itself is incredible - very comfortable. I've never had a long wait, and am usually out in less than an hour. The best part... No cavities! I have recommended Dr Ku's office to all my friends and family. I have been going to Dr. Ku's office for dental care since 2006. Stephanie is my hygienist, and she is awesome! They have always taken good care of me and remember details about my life as well as my dental care. I've recommended them several times to family and friends. Unlike many of my past experiences with dentists, my appointments always start nearly exactly when they were scheduled. This may seem trivial, but I have very busy calendars and have to know when activities will end as much as when they start. I've been a patient of Dr. Ku's for almost 2 years after moving from KC. Every time, very professional, efficient, even downright chatty at time but also thorough. Highly recommend to those seeking a better place for dental care. After my experience, they are caring for my entire family's dental health. Everyone in Fort Worth deserves the best for their smile! H. Peter Ku, D.D.S., PA has served local families with affordable dentistry for more than 20 years, and was named the 2017 Best Dentist Fort Worth by the Star-Telegram. 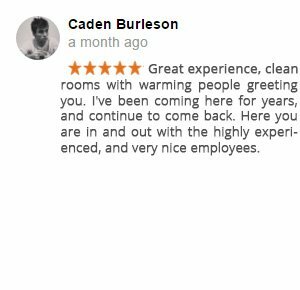 This is thanks to the reviews of patients like you. With specialties in family dentistry, dental hygiene, cosmetic and restorative treatments, Dr. Ku’s entire staff is proud to offer outstanding dental care and make smiles brighter for our local North Texas community. Why Choose Fort Worth, TX Dentist H. Peter Ku, D.D.S. PA For Your Dental Care? 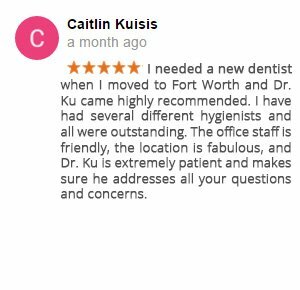 Dr. Ku and his staff are the #1 rated family dental office in Fort Worth based on patient reviews. Dr. Ku has been practicing dentistry for two decades, and his patients return year after year to keep up their dental health. We invite you to kick up your feet in a comfortable environment, where every treatment is delivered with care and expertise. Our attention to comfort is something you’ll read about again and again in online patient reviews. The staff consults with each patient to understand their needs and has a proven record of providing individualized and optimal service. Dr. Ku’s office provides the full range of dental care services including sedation dentistry and dental implants. Our health professionals offer comprehensive care and superior results; they are dedicated to exceeding patient expectations and educating patients on the best practices and right plan for their dental health care. They work to ensure that each patient experiences a lifetime of healthy smiles. Dr. Ku’s philosophy integrates oral health and dental hygiene with overall health. The office of H. Peter Ku, D.D.S. PA is conveniently located in Fort Worth’s 7th Street and Cultural District just minutes away from Downtown Fort Worth. Dr. Ku provides general, restorative, and cosmetic dental care in Fort Worth, TX. From pediatric dentistry and dental hygiene to regular cleanings and teeth whitening, Dr. Ku provides basic dental services and also has specialties in full-mouth reconstruction, dental implants and emergency dentistry. His North Texas dental office is dedicated to making your smile as porcelain bright and healthy as it’s ever been. We work with patients on an individual basis to help each and every one make informed decisions about their teeth and gums. Dr. Ku and his staff are invested in each patient’s overall health, which makes this consultation crucial. Dr. Ku wants patients to feel confident in the dental care they receive, which is why each procedure and treatment option is carefully explained with all questions answered. Whether patients are looking for general family dentistry to maintain good oral health or are seeking intricate dental services like teeth whitening, dental implants or endodontic therapy, Dr. Ku will provide you with an outstanding experience. If you want to experience the best dental care available in town, schedule an appointment with H. Peter Ku, D.D.S., PA to have something real to smile about—high-quality care with your awarded and experienced Fort Worth dental care practitioner.